Doug Fister doesn’t throw particularly hard. Today, his heater sat between 85 and 89, topping out at 90 a couple of times. The thing is, Fister knows he doesn’t have a very good fastball, so instead, he relies on a pitch he has a lot of confidence in – his change-up. See that big glob of yellow in the middle? That’s Fister’s change-up, and you’ll notice that the yellow glob is nearly as large as the green blob in the upper right hand corner (his fastball). That’s because he attacked the Yankees with a steady stream of change-ups, and he didn’t particularly care about the handedness of the opposing hitter. For most pitchers, the change-up is used almost exclusively against opposite handed hitters. Felix, for instance, almost never throws a change to a right-handed batter. He goes after them with fastballs, sliders, and curves, saving the change for the lefties. Fister, though, realizes that the change-up is his best pitch, and that it was his best chance to get Yankee hitters out, regardless of which side of the plate they were standing on. It worked, too. Of the 33 change-ups he threw (the Pitch F/x algorithm misidentified seven fastballs as change-ups, if you’re wondering why I’m quoting a lower number than what Brooks’ tool shows), he got six swinging strikes and four ground outs. He gave up two hits on the change, but one of them was A-Rod’s “single” to Josh Wilson where the throw pulled Branyan off the bag, and the other was Cano’s little bloop single to left. Wondering how a guy got through the Yankees line-up with a Triple-A fastball? By not throwing it all that much. By relying heavily on his change-up, Fister was able to keep hitters off balance and get ahead in the count. It even worked as an out pitch a few times, due to some really good locations. The fastball isn’t major league quality, and the curve is pretty blah, but that change-up is a weapon and Fister knows it. He’s not going to be a good major league pitcher with this repertoire, but when you command one good pitch as well as he does, you can survive with a big park and a good defense, which the M’s have. He’s probably still best suited to relief work in the majors long term, but there are worse guys in major league rotations than Doug Fister. When we talk about how it really isn’t all that hard to find back-of-the-rotation starting pitchers, he’s what we’re talking about. All I know is the guy has pitched a couple great games and they should keep running him out there until he turns into a pumpkin, if ever. Then they can try to figure out another pitch or for him to work on this winter. This is exactly how I was able to pitch into my college years. there are worse guys in major league rotations than Doug Fister. Speaking of which, when is Silva due back? Well-earned first major league win for Fister. Thanks for a great post. This analysis is really interesting. I don’t think we’ve seen the graphs as much this year, but I’m always happy to see this kind of post. Keep up the great work! 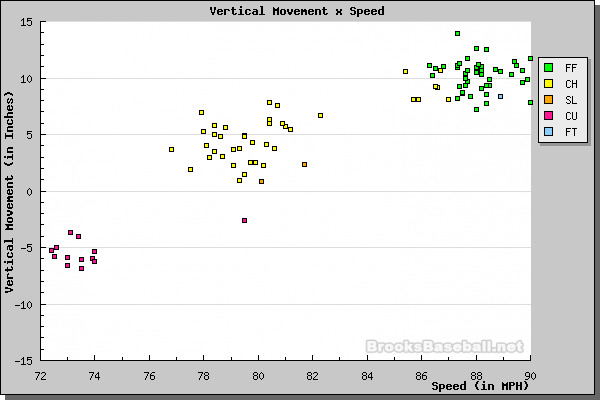 I have a (possibly dumb) question: Why do power pitchers like Felix not use the change-up much on same-handed hitters? I understand breaking pitches are more effective against same-handed hitters than opposite-handed, but why limit the types of pitches the batter might see? Why not try to keep them guessing? After all, that’s was a part of Fister’s success today: keeping the hitters off-balance. Is it a confidence issue? Meaning, do guys like Felix have more confidence in a slider/curve/cutter/etc. than a change-up? It’s just another painful reminder that we could have about 24 pitchers of Silva’s quality for what we are currently paying him a year. The only redeeming quality to his contract is that it comes off the books just as a rather more deserving starter is going to need to be resigned. The White Sox would probably look at Fister and teach him a cutter . . . I wonder if something like that would help him. It seems to me that if he could get another pitch even to fringe-average, as good as his change is, he’d have a pretty workable repertoire. A guy named Moyer ended up having a pretty good major league career with a below average fastball, great changeup, and good control. Yeah, but he’s left handed and has a heartbeat. Yeah, but heâ€™s left handed and has a heartbeat. Are you saying Fister has no heartbeat? I’m afraid the meaning of the comment went past me. To clarify, Dave says Fister is either a back of the rotation starter or else a reliever. I think his absolute upside would be something like a right handed Moyer, whereas something along what Dave is predicting might be, what, a righthanded Lee Guetterman (who also lacked a fastball and bounced between starting and relieving? And Fister’s downside would be to wash out in a year or two like Bob Wolcott. There’s only been one Jamie Moyer. There’s no point in comparing every guy with a crappy fastball to the once-in-history dude who made it work. OK, then I’m going with Fister = Guetterman, for a reasonable comparison of what his career is likely to look like. Yah, I felt Fister accomplished alot there yesterday with that pitch. More then I thought he would get away with. Good on him for the effort. I hope he continues to develope. The Mariners have collected quite an assortment of back end starters, left and right hand. Not one of these guys has showed ability/skill/durability to stick. RRS,Vargas,Olson,Snell,Morrow,Silva,French have all been in and out of the rotation for numerous reasons. We have one starter Felix. There needs to be at very least 2 more pitchers that can log 200 quality innings next year along with felix. Who are the most like guys that will step up and take those rolls? Care to prognosticate? There needs to be at very least 2 more pitchers that can log 200 quality innings next year along with felix. Why? Just because that’s usually how it’s done? This year has proven that you can run an assortment of back end starters out there for a few games apiece and get close to the same results. It hasn’t been the pitching that’s been the problem this year; the M’s have not lost a lot of blow-outs. With a little more offense they’d still be in the hunt for the post-season.